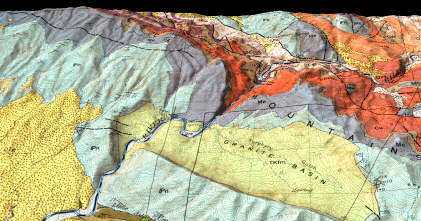 This web site contains 3D geologic maps, created by draping color geologic maps over digital topography. The site features QuickTime Virtual Reality (QTVR) object movies where the user can spin the 3D geologic map to view it from different perspectives. It includes static 3D-perspective images (JPEG files) of the 3D geologic maps for those users with slower Internet connections. The site also contains a topographic contour map for each 3D geologic map, so that instructors can develop exercises where students map contacts and faults onto the contour map, using the 3D geologic maps as a guide. Students can then draw geologic cross sections, using the strike and dip symbols visible on the maps, three-point problems, and the topographic contours. The link below is to a cute little, and I mean little, movie to see what the bigger ones will be like. Visit the 3D Geologic Map Information Page to see where I got the data, how I constructed the movies, and who helped fund it. All materials are copyright �2000 by Stephen J. Reynolds, but can be used freely for educational, noncommercial uses, as long as the source is cited. If you use the site, tell me, because it's a nice thing to do. Painted Canyon -- A Geologic Wonderland! These images, done with Bryce4, are of an imaginary, but representative, Southwestern canyon. They are used in our Intro geology lab. Some of the files are large (not very compressed), especially the cool QuickTime VR panoramas (pivot 360 degrees). The Davis-Reynolds Structure Book: Info and Reviews -- George Davis and I wrote the most widely used undergraduate structural geology book. Look for these types of images to be in the next (third) Edition.